In the 1990s, the current United States “Back to Sleep” program began to reduce the risk of SIDS (sudden infant death syndrome). This program has been very effective at saving lives. 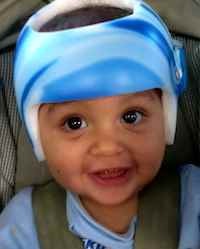 Unfortunately, since then there has been a marked increase in plagiocephaly (abnormal head shape) in children. While there are other causes of plagiocephaly the vast majority of it is caused by a pulled neck muscle refer to as torticollis. This neck muscle injury could occur in the womb, at delivery or anytime the child’s neck is not well supported. When an adult pulls a neck muscle they consciously attempt to stretch it out. When babies pull a neck muscle they choose to look the way that it does not hurt. As they keep there head turned they begin to develop an off-center flat spot on the back of their head. If not corrected this will worsen and begin to effect other areas of the skull. Given time the child’s torticollis will get better but the abnormal head shape could last. The head shape does not affect brain development, it is a cosmetic problem. 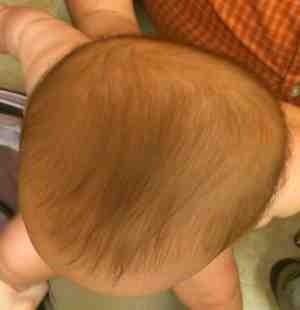 The best way to evaluate a child for plagiocephaly is a “satellite view” as shown in this picture. This child has developed a flat occiput (back of the head). Therapy is centered around stretching out the pulled neck muscle to allow the head to rest in a more normal position. Breastfed infants are often forced to turn their heads both ways by feeding on both breasts. Formula fed infants whose parent feed the same way are often not forced to turn their heads both ways. 1.) Reverse how you feed your child. This is especially important for bottle fed children whose parents feed the same way. Simply by switching hands, you can begin to correct the problem. 2.) In most cases, I recommend gentle stretches with every diaper change. The two preferred stretches are turning the head from side to side in a “no” pattern and from ear to shoulder. These stretches should not be forced. Stretches should be done when child is relaxed and happy. 3.) Minimize your child’s time in car seats, swings and other “containers”. When they are in their car seat, place your child’s car seat toys toward the side that you want him to look. 4.) When you place your son in his crib orient him so that he is encouraged to stretch his neck. This orientation forces them to self stretch if they want to see desired objects. Place them in the crib such that when he wants to turn and look at the middle of the room he will be stretching the damaged muscle. 5.) One of my boys had torticollis and I felt we saw the most improvement “bouncing” him around the house with is neck being stretched. When I held him I would gentle turn his head and “bounce” him for comfort. If home stretching fails some children will need physical therapy.